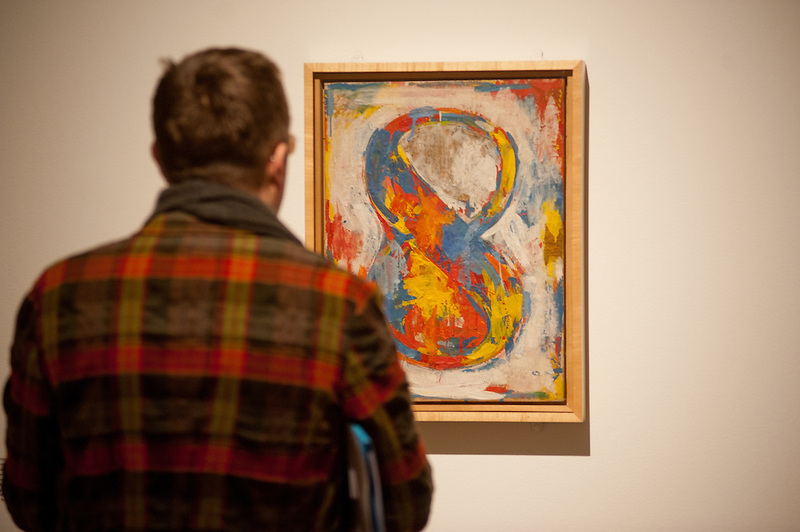 London, UK - 13 February 2013: a visitor looks up at Jasper Johns's 'Figure 8, 1959' at the 'The Bride and the Bachelors - Duchamp with Cage, Cunningham, Rauschenberg and Johns' exhibition that opens to the public on 14 February and runs until 9 June 2013 at Barbican. It is the first exhibition to explore Marcel Duchamp's impact on four great modern artists - composer John Cage, choreographer Merce Cunningham and visual artists Robert Rauschenberg and Jasper Johns. reportage photo reportage photo reporter features reportage photography reportage photographer documentary photographer documentary photography editorial reportage photographs photographs image images picture pictures photo photos project photoproject photo project photograph photographs event photographer event photography events photographer events photography event photographer london events photographer london press photographer london press photography london press photographer news photographer fotografo a milano fotografo milano fotografo milano centro fotografo lombardia fotografo "milan photographer" "photographer in milan" "photographer in bergamo" "photographer milan" "photographer milano" "photographer in milano" "italian photographer" "photographer in italy" "photographer in lombardy" "fotografo a como" "fotografo a pavia" "fotografo a bergamo" "fotografo a trieste" "photographer trieste" "fotografo di milano" "fotografo a milano" "photojournalist in milan" "corporate photographer" "event photographer" "fotografo di eventi" "fotografo di eventi milano" "photographer in bergamo" "photographer in trieste" "event photographer milan" "milan photographer"